Lunchtime is the primary social period during the school day. Many students look forward to lunchtime as an enjoyable time with friends and a much-needed break from studies, but students who feel like they are on the fringes often look upon this agonizing hour with dread. National No One Eats Alone Day is a student-led movement that aims to reduce social isolation by promoting kindness, acceptance and inclusion. Students can seek and find classmates in need of a friend, yet many students feel uncomfortable with introducing themselves to someone that they have never met before. Therefore, lunchtime events and activities are helpful icebreakers that encourage positive interaction on campus so that all students feel welcomed and included. No One Eats Alone Day aims to create a sense of belonging and connectedness among students on campus; a spark that inspires students to accept others in light of their differences. Invite a lonely student to sit with you at lunch. With administrator approval, conduct an anonymous poll (like this one here) that collects students’ perceptions of school climate on your campus. Use the data in your No One Eats Alone Day projects, campaigns and initiatives. Host a lunchtime event with activities that promote positive social interaction. Start a school club to welcome new students or to give all students a welcoming place to spend lunch time. Like this student here. Design informational flyers and posters that educate and inform your student body on the problem and effects of social isolation. Produce a 30-60 second video Public Service Announcement (PSA)* that encourages your fellow students to reduce social isolation and create a culture of acceptance and inclusion. Coordinate with the appropriate school staff members and broadcast the video on the school network, website, or school-based social media channels. Create a 3-5 minute Short Form Documentary* on social isolation and the positive impact that this initiative has made on your school campus. Demonstrate how kindness, acceptance and inclusion reduces social isolation. Your video may include true stories from students, perspectives from teachers and administrators, and expert interviews. Coordinate with the appropriate school staff members and broadcast the video on the school network, website, or school-based social media channels. Ask your high school Student Council or Associated Student Body (ASB) to promote this initiative through assemblies, posters, lunchtime activities and even a social media campaign! iDrive reaches millions of students nationwide. Inspire students all across the country to reduce social isolation and promote acceptance and inclusion in their own schools by submitting your projects to the iDrive Student Advisory Board below. *Important: Make sure that everyone has given you a signed Personal Release Form. Always get permission from parents/guardians before you record those under age 18. Need some inspiration? Watch the National No One Eats Alone Day video produced by our iDrive Student Advisory Board video production team. Want to contribute social media content to future iDrive campaigns? 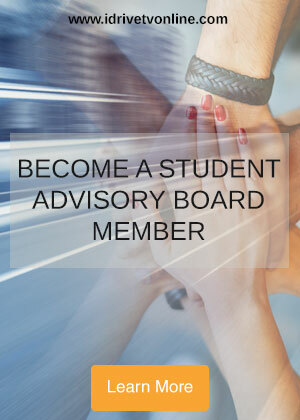 Submit your application to join the iDrive Student Advisory Board here.